Pakistan lies in a semi arid to arid region with neither sufficient nor reliable rainfall. 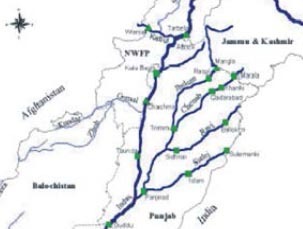 Indeed country agriculture depends on Indus river irrigation system which maintains the integrated irrigation network of Indus basin irrigation system. Under the burgeoning population pressure, the water resources are depleting at high speed. Climate change and speedy competition for irrigation purposes will further increase the water utmost needs. Plant water stress results from the interaction of soil water status, evaporation demand, physiological and genetic factors. The genetic approaches are being able to significantly improve water stress tolerance in wheat. The field based approaches have been resulted for the improvement and conservation of diverse and potentially additive tolerance model comprising genetic interactions. Best combination among diverse genotypes with increasing yield and yield contributing traits of spring wheat in the face of climate change and scarce water may be the best success to ensure food security and law and order. The tension between tradition and innovation provides fuel for pushing on the frontiers of progress and ‘never calling it quits’! This entry was posted in Publications and tagged agriculture, agronomy, cereals, climate, dams, drought, genetics, irrigation, Population, Punjab, Water stress, wheat. Bookmark the permalink.